SAN DIEGO (AP) — In a last-ditch effort to end their long, bitter push for a new stadium, the San Diego Chargers have joined a diverse group that includes some polarizing figures and civic lightning rods who have been involved in various issues in a city known for political dysfunction and an inability to get big projects done. The Chargers are collaborating on a citizens' initiative started by Donna Frye, a former city councilwoman who champions open government, and attorney Cory Briggs, who has excelled at beating City Hill. The two, who want the public to have a say in how tax dollars are spent, oppose an expansion of the bayfront convention center and are championing a joint-use stadium and convention center expansion a few blocks inland, near Petco Park, the home of baseball's Padres. A convention center expansion would be funded by an increase in hotel room taxes. The Chargers haven't divulged financing details, and spokesman Fred Maas didn't return calls seeking comment. Frye and Briggs have been slowly building a somewhat unlikely coalition. "People are talking to one another," Frye said Wednesday. "It takes time to get people to sort of throw off their preconceived ideas and biases and prejudices and whatever and focus on what it is we're trying to do. There are a lot of lightning rods. We might have a big old electrical storm. No doubt about it it's an interesting cast of characters. It even makes me laugh some time." Still, the Chargers are going against Mayor Kevin Faulconer and County Supervisor Ron Roberts, who are pushing a stadium in Mission Valley, site of the Chargers' current home, Qualcomm Stadium. The team knows there will be significant financial and political hurdles. It likely will be the most-heavily campaigned issue in San Diego history, pitting the NFL team against City Hall and the powerful tourism-convention industry. 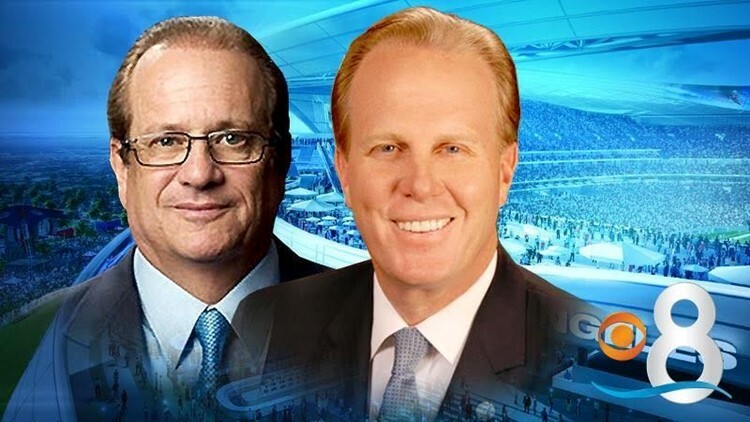 In a meeting Monday with Faulconer and Roberts, Chargers chairman Dean Spanos asked for an additional $200 million in public financing and was turned down. The $350 million the city and county have offered for a new stadium at the Qualcomm site is in jeopardy because they have not put forward a plan for downtown. If the Chargers fail to win approval on the November ballot, they have the right to join the Los Angeles Rams in a stadium set to open in Inglewood in 2019. There are some interesting dynamics in the Chargers' alliance with the Briggs Initiative, as it's known. The Chargers plan to partner with JMI Realty, which is owned by former San Diego Padres owner John Moores and has significant holdings near the convention center. Moores' reputation took a hit when a nasty divorce forced him to sell the Padres. As part of the deal, Moores kept $200 million in upfront money from the team's TV deal with Fox Sports San Diego. Moores and the Spanos family sometimes clashed when they shared Qualcomm. In the mid-1990s, the Padres began campaigning for a new downtown ballpark. They suggested to Chargers owner Alex Spanos that the NFL team also look downtown. Spanos dismissed them. The city expanded Qualcomm for the Chargers in 1997, and three years later, Alex Spanos said the team needed a new stadium. The Padres got Petco Park approved by voters in 1998, just a few weeks after being swept by the New York Yankees in the World Series. It opened in 2004, delayed by several lawsuits and a federal investigation into Moores' dealings with a city councilwoman. One of Moores' senior advisers at JMI is Steve Peace, a former Democratic state legislator who has bemoaned that Alex Spanos contributed to every opponent he ever had. Briggs successfully sued to stop downtown hoteliers' plans to finance a contiguous convention center expansion. Chargers fans scorn team attorney Mark Fabiani, a long-time Democratic operative who last year used a scorched-earth campaign against San Diego politicians as he attempted to clear a path to Los Angeles for Dean Spanos. While NFL owners voted down the Chargers' plans to partner with the rival Oakland Raiders in a stadium in Carson, they did give Spanos the chance to partner with the Rams. Briggs said he's trying to convince the downtown hoteliers to join his coalition. "If 80 percent of the stakeholders can get 80 percent of what they want and the city benefits overall, why not do it every time the opportunity presented itself," Briggs said. "If 80 percent get 80 percent. It's a good deal." A new Chargers stadium downtown would affect the Padres. Moores plans to build a hotel on one of the premier parking lots near Petco Park, and the team leases a parking lot owned by the city that would be needed for a new NFL stadium. The Padres make several million dollars a year in non-baseball events, including concerts. Executive chairman Ron Fowler is a civic heavyweight and friend of Spanos. Padres lead investor Peter Seidler said the team needs to study details of the Chargers' proposal. "We matter," he said. "We're significant in this whole equation."